For hundreds of years, humans have selectively bred species. Farmers selected crops with the best traits: tomatoes that were the most plump and full of flavor, lettuce with the largest leaves, flowers with the best color. Broccoli, cauliflower, cabbage, and kale all originated from a single form of wild mustard weed. Additionally, humans helped to develop modern dog breeds by breeding those with the most desirable traits. These are examples of selective breeding, a form of causing a species to change and one form of evidence for biological evolution: the change of species over time. This unit will examine the statistics of traits in a population, evidence for biological evolution, and what can influence the survival of an individual as well as a species. ​Are humans deciding the fate of future species? 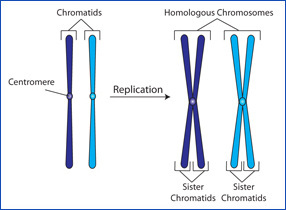 Chromosomes, chromatids, sister chromatids: what is the difference?